The most important book ever written regarding our most shameful and public miscarriage of justice. The mysterious death of nine-week-old Azaria Chamberlain near Ayers Rock in 1980 sparked the most widespread controversy ever known in Australia and one that endures to this very day. While Azaria’s mother, Lindy, claimed a dingo had taken her baby, she was widely disbelieved. An ever news-hungry media had a field day, disseminating rumours and stirring up suspicion against a woman whose demeanour in the face of tragedy they simply could not understand. Lindy was found guilty and jailed for life, while her husband was found to be an accessory. Two appeals were lost, but by 1986 the build-up of scientific evidence corroborating the Chamberlain’s story became so overwhelming that the Northern Territory authorities released Lindy rather than re-open the inquiry. A year later a Royal Commission granted her a pardon and in 1992 she and Michael Chamberlain received over $1 million compensation. 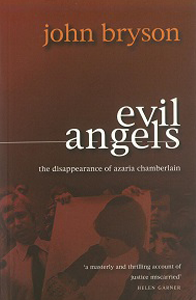 Evil Angels is the gripping account of the Chamberlains trial and its aftermath, events that shook Australia’s faith in its justice system and its media, and revealed a savage new dimension to the lucky country. It is a compelling narrative of events and issues which are still with us today. Born in Melbourne, John Bryson studied law at Melbourne University and later joined the Victorian Bar. He was a member of the then Literature Board and later its deputy chairman during the 1970s. His fiction is published in literary magazines and periodicals and his feature articles in leading Australian newspapers. His other work includes Whoring Around (stories), Backstage at the Revolution (articles) and To the Death, Amic (fiction).